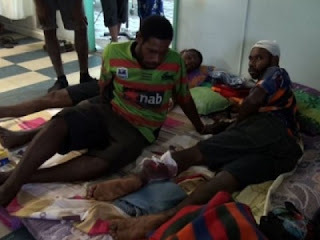 Relatives of the Black Cat Trail attack victim who died on Sunday have expressed anger over the state of the Angau hospital’s facilities. The deceased, Lionel Aigilo who sustained severe knife wounds to his head, hands and legs was in a state of shock when he was flown in on Wednesday morning. He was sedated and placed in intensive care at Angau hospital. Four days after the attack, Lionel and the six other injured porters still had not undergone surgery as expected. By Friday last week, doctors told visitors that they were still waiting for the hospital’s only working operating theater to become available for use. The arrival of the porters exposed the Angau hospital’s long standing staffing and equipment problems at a time when services were urgently needed. On Sunday evening, Lionel’s condition worsened. “When I arrived at the hospital they were trying to resuscitate him but it was too late. I knew he was gone,” said Passingan Taru, a relative. In the few hours during which he was conscious, Lionel Aigilo reportedly told those nearest to him that he wanted to be taken to another hospital to undergo treatment. Angau is a hospital that has come under intense scrutiny this year following a debate between the management and the National Government over a 65 million kina design proposal which the management maintains will transform Angau into a modern hospital. The total cost of the reconstruction is estimated to be around 600 million kina. The National Government still has not backed down on its position but it has found a new funding source for the reconstruction. Through the Asylum center deal, Australia is expected to fund the reconstruction of the hospital at the cost of about 650 million kina. But while the long term plans appear to be progressing well, the hospital’s short term needs still have not been addressed. There is a shortage of beds. Basic equipment is lacking and medical supplies had to be donated to the hospital to cater for the porters’ injuries. “Our nursing staff numbers in the surgical department have been slashed from 15 to nine and we are unable to maintain three shifts as required,” said Dr. James. Despite the problems, key staff members remain reluctant to talk about issues affecting Angau hospital. That reluctance coupled with rivalry became apparent as visitors and relatives expressed concerns over the hospital’s slow response in treating the six porters. “When we asked if the boys could be moved to another hospital, one doctor told us: ‘if you take them to another hospital, don’t bring them back here,” said one of the relatives.